Plastic and metal Versace VE1220B frames create a unique and intelligent contrast. You'll get the reliability and practicality from the combination of materials while also creating a stylish persona. A great feature of these stylish frames is the adjustable nose pads for your comfort and fit. More durable than rimless glasses, these affordable semi-rimless frames are light and easy to wear. If you're a lover of books, semi-rimless reading glasses are a must, as they have no outline below your lenses, giving you a larger better view. If you love the elegance of the butterfly silhouette frame, these are the perfect sunglasses for you. With subtle elegant temples and distinct curves, you'll be able to remain glam no matter where you are. 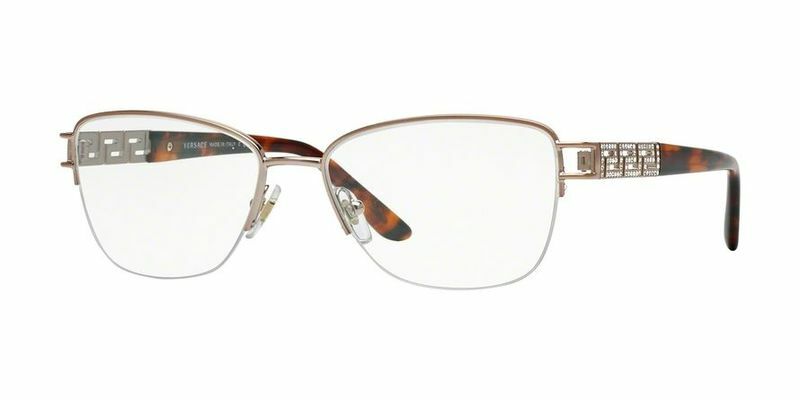 High fashion is hard to keep up with, but you'll be moving in the right direction with these cool Versace VE1220B eyeglasses that epitomize style and cool. Stay ahead of the game, because these are eyeglasses that are taking you places. If you were buying a new suit, you'd expect it to fit perfectly to your body, right? The same goes for your Versace VE1220B glasses. A high temple positioning will create more comfort to for those with rounder features.